Picasso's list of stimuli culminates with sharp precision in a spider's web - prophetically, as it turned out, for one curious development in the wake of Guernica was the series of paintings and drawings in which figures, objects and setting are depicted as an intricate, filigree web of lines. Related to them are others of a more sculptural character in which figures and objects look as if they have been fabricated from basketry, wickerwork, straw matting and the like. In 1938, having hit upon this novel solution to the constant problem of repeating himself - 'I have a horror of copying myself is the very next sentence in the monologue reported by Zervos - Picasso became obsessed with it. He remained fascinated by the expressive potential of webs and weavings of one sort or another throughout the occupation. 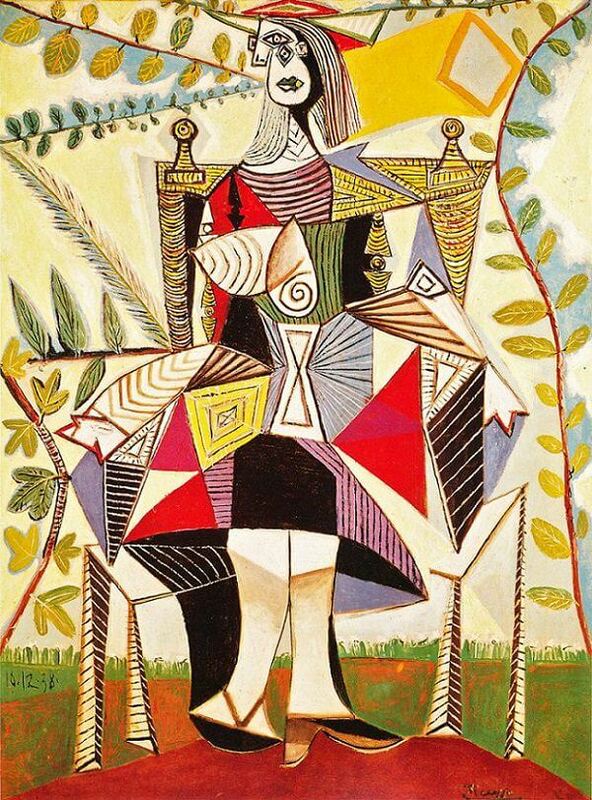 Seated Woman in a Garden, 1938 gives an idea of the lengths Picasso was prepared to go to unify every square centimetre of a complex composition when working in this style. Different details suggest different sources in the outside world, but pride of place is accorded to the spider's web. The figure of Dora Maar here looks like a real spider's web for anyone to miss the allusion, or the sinister warning of fatality it entailed. The women themselves - predators or prey, we cannot be sure - their chairs, the parasol and the foliage are constructed from hundreds of segments which look, variously, as if they have been knitted, woven, plaited, embroidered and stitched by the spider's human imitators. Seated Woman in a Garden was finished in a single day, Dec. 10, 1938. The painting fetched $49.5 million at November 10, 1999 Sotheby's, New York Auction, and is considered one of the most expensive painting is the world.